One of the hallmarks of Holmes County is the chance to experience the “traditional” ways of doing things—We’ve got our beautiful old barns, the chance to see horse-drawn agriculture on a daily basis, and the DIY/self-sufficiency mindset has permeated the culture here long before it was popular in the rest of the country. However, we can also be proud of the ways we innovate and experiment—And your SWCD office is excited to share with you the chance to be on the cutting edge of a conservation model. Holmes SWCD coordinates an extensive aerial cover crop seeding program for area farmers. By now, you should have heard of our cover crop program—If not, I haven’t been doing my job right! I can’t count the number of press releases, articles, and social media posts that I’ve seen in the 18 months that I’ve worked here…And I’m sure many of you have seen the cover crop signs, the aerial seeding in September, and the fields that are lovely and green even in February. It’s kind of a big deal around here! This year is no exception- local farms applied for over 7,500 acres! Across the Muskingum watershed, applications are up over 12,000 acres from last year. This represents a great buy-in to conservation from our agricultural community. Yes, some of our producers will be able to use the cover for forage, or harvest some wheat for straw or grain, but over half are planting solely for the conservation benefits. And no matter what reasons they choose for planting, keeping a living crop on the field for as long as possible improves soil health, and protects against erosion and nutrient loss. This program has been counted as a great success across the Muskingum watershed, and we are interested in building on this success by offering the members of our community the chance to show their support for conservation practices. Our office has been working with the Muskingum River Watershed Joint Board (which comprises representatives from Soil and Water Districts in the Muskingum River watershed) to develop a nutrient stewardship program. Our new program, catchily dubbed “Credits 4 Conservation”, allows us to sell the nutrient stewardship credits generated by the previous year’s cover crop program. Each conservation credit represents one ton of sediment, one pound of phosphorous and two pounds of nitrogen that were prevented from entering our local waterways. Last year, cover crops in Holmes County generated 15,209 credits, meaning 15,209 pounds of phosphorous were kept out of our water. Over 16,000 tons of soil didn’t erode into local rivers. 30,000 pounds of nitrogen stayed in the soil. 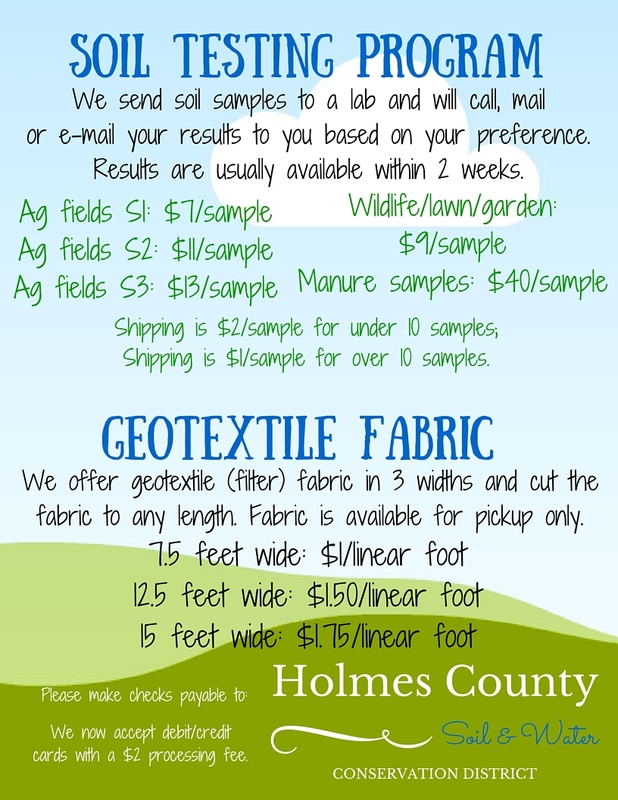 We hope that Holmes County businesses (and individuals!) who would like to demonstrate their commitment to water quality will recognize the work and expense that our farmers go to in planting cover crops by purchasing credits. This program is designed as a way to proactively contribute to local conservation, by funding a pool of money that we will put towards projects in our county. Many times, grants or funds that we have access to come with stipulations that prevent certain issues from being addressed by our office, or we are limited to where we can spend the funds. The money generated by the sale of these credits will be reinvested in programs that aid local conservation efforts across the county. This way, local dollars are staying in our county, and local voices will have the discretion in how it is spent. The farming and tourism economies of our county are inextricably linked to having reliably clean and safe water, and we are committed to trying new ways to keep stewardship of our natural resources a priority in Holmes County. Please consider partnering with us to make sure the richness of our natural resources is available to residents and visitors alike, now and in the future, to benefit our livelihoods and enjoyment.. For more information, or to purchase credits directly, check out the Credits 4 Conservation site.